Most of us don’t make major purchases lightly. Stick vacuums may not be as pricey as cars, but it’s still wise to research them before you buy to make sure you’re getting the best value for your money. To help you select the perfect stick vacuum for your needs, we’ve analyzed expert and consumer reviews, then rated each vacuum in a variety of categories. 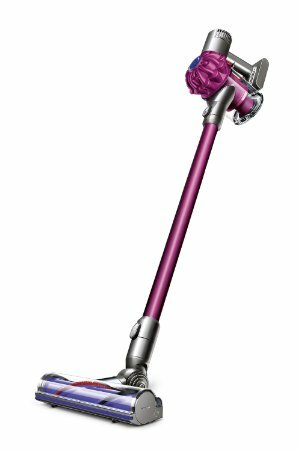 Despite its somewhat whimsical pink and purple appearance, the Dyson V6 Motorhead is a powerful vacuum. It features a direct-drive bristled head that reaches deep into carpet, giving you 75% more cleaning power than its predecessor, the V6. The stick vacuum’s balanced wand makes cleaning high-up surfaces, such as moldings, a breeze and it easily converts into a handheld vacuum for smaller areas, such as car interiors. Switch on max mode to get even more suction for bigger messes, and once you’re done, clean up easily with the push-button emptier. Each three-and-a-half-hour charge gives you 20 minutes of cleaning time. The Dyson V6 Motorhead comes with a docking station, a crevice tool and an accessory tool. Other accessories are available for an additional cost. The Dyson V6 Motorhead is available through the Dyson website for $399.99, but you can find it elsewhere — sometimes for less — at retailers such as Best Buy or Amazon. Compare the Dyson V6 Motorhead with other top vacuums in NerdWallet’s Best Stick Vacuums. We’ve analyzed reviews of some of the most popular stick vacuums on the market to come up with a definitive buyer’s guide. We looked at expert opinions from review sites such as The Sweethome, CNET and Good Housekeeping. Next, we analyzed user reviews to see what shoppers were saying about the various attributes of each vacuum. The Dyson V6 Motorhead ranked fifth among all vacuums. It stacked up very well against seemingly more powerful canister and upright vacuums, though many reviewers found its charge left something to be desired. It came in third place overall on cleaning hardwood floors, but was deemed the best at vacuuming carpeting. The Motorhead ranked highest among stick vacuums in our review analysis. Reviewers were almost uniformly impressed by the Dyson V6 Motorhead, giving it perfect “10s” for its overall cleaning ability and ability to clean hard floors, carpets, stairs, and pet hair. Users said it maneuvered easily — another perfect 10 — and was very durable (9.8). Reviewers also liked its powerful suction and neat push-button bin emptying system. The biggest gripe users had with this Dyson was the life of its charge, on which it scored only a 6.8 out of a possible 10. Some complained that 20 minutes of regular usage or about six minutes on “max” mode was not nearly enough time to get the job done. Its bin was also too small for some users. Additionally, the Motorhead was judged a little noisy (7.5), but overall, its feedback was overwhelmingly positive. Out of all the stick vacuums ranked in our survey, the Dyson V6 Motorhead scored the highest with users, and was also less expensive than similar models, including the V6. Reviewers particularly called the Motorhead out for its performance on stairs, so it can be a good fit for people with multi-level homes, though the 20-minute charge may make it a better option for apartment dwellers or those with larger houses who want a supplemental vacuum.